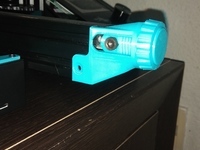 RRD Hall Effect Sensor Endstop Case for PrintrBot LC/PLUS Z axis by VintageTimeAustralia is licensed under the Creative Commons - Attribution - Share Alike license. Here we have a tiny case for a hall effect sensor end stop for a Printrbot LC/PLUS. 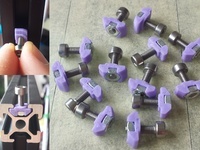 It's designed to attach to the stock end stop holes with the stock screws, then for the PCB to screw on to the caase with M3 screws. May need some adjustment on the holes depending on your machine. The notch underneath is so you can put the wiring back through the stock hole into the base of the machine. 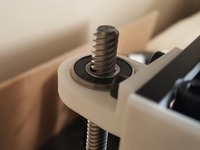 This endstop has on the back "designed by rrd" and is available from BilbyCNC from their online store. 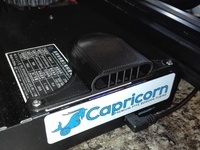 It is designed to plug straight onto the Printrboard and happily run. In addition to this, you will need to invert the end stop, as the hall effect sensor works the opposite way to a microswitch, so it is closed until open, microswitch is open until closed.